Seeking flexibility and functionality, I switched from a traditional phone carrier to using Google Voice. The voicemail transcription is a feature I utilize frequently. Despite the horribly inaccuracies, all I need is the gist of the call. At times, this proves to be quite challenging. Considering these technology’s depth and extension into our lives, and our dependency upon it, what happens when our tools are inaccurate? How does this impact us? Voice communication technologies bear a responsibility that is quite fragile. Voice needs to travel, in less than 150 milliseconds, across the network, arriving in the same form that it left. It cannot be transported like traditional network traffic. If any of those voice packets are lost or late, communication breaks down. Voice over Internet Protocol (VoIP) attempts to overcome these challenges. Another layer to the problem is the voice transcription software. Things get more complicate and fraught with inaccuracies when these tools combine. Transmissions from the System underscores the need to develop these tools and highlights the absence of the real thing. Voicemail messages are pulled from my server to the micro-controller. 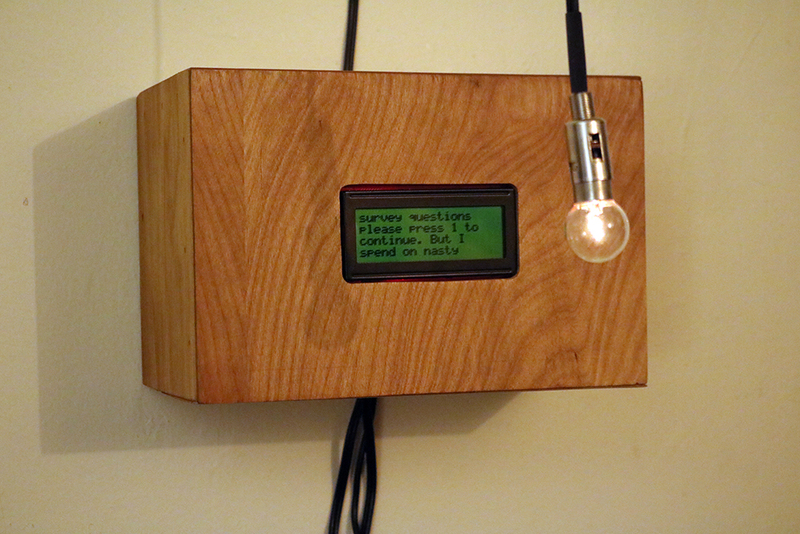 The LCD screen shows the voicemail transcript, while the voice envelope (aural element) is mapped to the light bulb’s light level. The light and the text are message artifacts. The light is a transcription of the voice created through electronics. Yet viewers are left with an absence of audio. The text transcription is an artifact of the message, created from complex software and analysis. Neither can fully recreate the original nor be fully accurate. Something is lost in the transmission. The viewer is left with these translation artifacts and the gapping absence of the real thing. Transmissions from the System shows the disruptions in our communications. We rely heavily on voicemail and text as a substitution for in-person communication as a result of societal needs and constraints. As we develop more tools to facilitate time and productivity, they often further disrupt our communication from traditional real-time methods, affecting the content of the message itself. How does this effect our interpretation and our next action? Will these tools be honed to greater perfection? In the meantime, will we develop alternate methods and styles of communicating? TFS makes these disruptions visible and tangible. Transmissions From the System makes the system visible, through glitches. When an interface fails or breaks down, we notice it. The glitch makes what was transparent, apparent. The repair of this problem is multi-layered and complex. The system code produces the text transcription, making visible the code’s inaccuracies and it’s attempt at generating human communication – a new text. The creation of the transcription breaks down and often destroys the human generated message and our language, with which it was entrusted to carry. Yet, it’s still tolerated as the end user acts as a codebreaker: deciphering the transcription as if it were an encoded message.